In addition to Supporting Student Success outside the academic realm, our family involvement committee hosted a “Don’t Text and Drive” event concurrent with AT&T’s “It Can Wait” campaign. Two driving simulators were staged in the cafeteria during all lunches and the students tested their texting and driving skills. 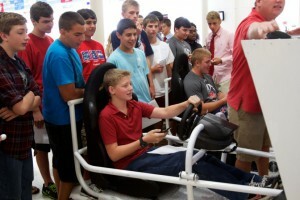 The computer software used with the driving simulators reinforced to students that texting and driving is indeed dangerous. As a result, students pledged their commitment to not text and drive on a large banner that was prominently displayed in the hallway. 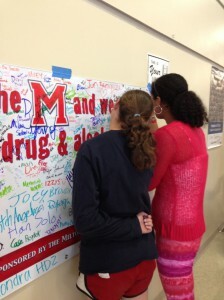 Milton students sign the pledge to be drug and alcohol free during Red Ribbon Week. MHS PTSA celebrated National PTA Red Ribbon Week with daily events, sweet treats, gifts, and pertinent health related information. Events included the giveaway of holographic wrist bands, promotional candy, a pledge banner, and a contest. To further support student success, to help alleviate student stress, and to encourage a sense of community, this year a special area was designated by MHS administration for our seniors. The PTSA developed the area, now called Senior Square. Starting in the summer, the area was weeded, trimmed, and new mulch delivered and spread. We recruited several Eagle Scout candidates and they incorporated our needs into their Eagle Scout projects. These projects included building picnic tables and the creation of a life size chess board complete with life size chess pieces. The PTSA painted checker boards on the picnic table tops and purchased several corn hole games. The purpose of Senior Square is to provide the senior class with a special area where they can retreat for lunch and enjoy a break from the stressors of the school day. 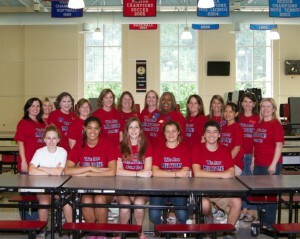 Cynthia Knutson and Donna Savas (Milton High School PTSA, Milton, GA). Cynthia has been involved in PTA for over 20 years and has held many positions including Co-President, VP positions, nominating committee, and will hold a VP position next year on the North Fulton Council PTA board. Donna has been involved in PTAs for over 10 years, holding various positions including Co-President at each school level, VP roles, and many various committee chair positons.